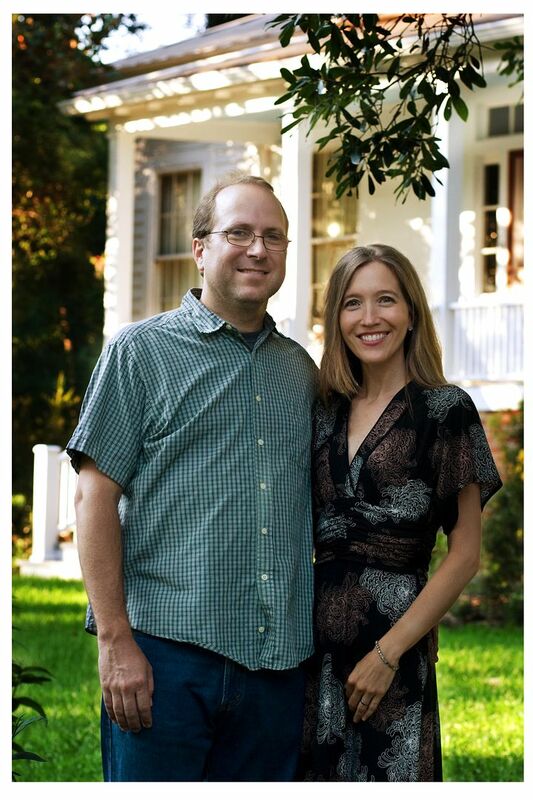 Um, this picture is a little dorkier looking than I had intended--but anyway, here we are, Rob and Leslie, standing proudly in front of our lovely old house in Quincy, Florida. It's a Florida cracker house (a vernacular wood-frame house), built in 1850. Like all old cracker houses, it's very plain and solid, with big rooms and deep, shady porches and excellent air circulation. Cracker houses come in many different styles. Ours is a four-square Georgian, meaning it consists of four identical square rooms, two on each side of a wide central hallway. In the beginning, that's all there was--four rooms (not counting the outbuildings)--but later (probably in the 1920s), a bathroom, sunroom, and kitchen were added to the main house. The original detached kitchen still stands (I think it looks like a little white country church), but the other outbuildings are long gone. Our property backs up to the old Floridin mine, a fuller's earth mine, and in the old days, we've heard, the mine's foreman lived in our house. Just about the only other thing I know about the house's history is that by the 1970s it was standing vacant--abandoned. The city was about to condemn it and tear it down. Apparently there were vines growing up through the floorboards, and you couldn't even see the house from the road anymore because of the jungle of weeds that had sprung up around it. Luckily, in 1972 a young couple rescued the house. They bought it for a song and spent the next 20 years fixing it up, doing all the carpentry and construction work themselves. Rob and I bought the house in 2004. Since then, we've restored the front porch, added a breezeway to link the main house and the old detached kitchen, and done loads of landscaping with native plants and heirloom vegetables. We still want to redo the bathrooms and kitchen, put "Quincy green" shutters on all the windows, paint the garage barn-red, and plant about a million more plants. Stay tuned for updates on our progress!